The McDonald’s Owner/Operators of Chicagoland and Northwest Indiana (MOCNI) have issued a call to Chicago-area food enthusiasts and burger lovers to participate in the 2015 McDonald’s Chicagoland Burger Build Off. Customers can visit www.burgerbuildoff.com to build their dream burger. On the site, guests will follow a series of prompts allowing them to select each ingredient of their customized creation – from the style of bun and beef patty to a wide range of artisan cheeses, fresh veggies, flavorful toppings and tangy sauces. 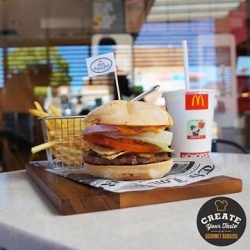 They can then name their burger, share their masterpiece via Facebook and Twitter, and encourage family and friends to vote online to help their burger advance to the next round of competition. Participants can submit their burger creations online through August 23rd. In addition to being recognized as McDonald’s Chicagoland Burger Build Off Champion, the creator of the winning burger will receive a check for $5,000 and a trip for four to Universal Orlando Resort. For a complete listing of contest rules and prizes, visit www.burgerbuildoff.com.